Find results that have all these words: The standard search returns results that include any of your search terms; for example, if you search for Spock loves cookies, then you get results that contain either Spock, loves, or cookies. If you use the “all these words” option, your results contain all three words (but not necessarily together as typed in your search phrase). If you know anything about Boolean searches, this option is like typing Spock AND loves AND cookies in a search box. Find results that have this exact wording or phrase: If you want to see results that include the word or phrase as you typed it in, use this option. For example, if you search for Spock loves cookies, then all your results must include that exact phrase. In Boolean search, this is the same as enclosing a search word or phrase in quotation marks in a search box, like so: “Spock loves cookies”. But don’t show items that have any of these unwanted words: You may want to eliminate results that contain certain words because you’re not interested in them. For example, if you search for Spock loves cookies in one of the options above, but you don’t want results that contain oatmeal, then type oatmeal in the “unwanted words” field. Any results for Spock loves cookies containing the term oatmeal will not display. In Boolean search, this is the same as typing Spock loves cookies NOT oatmeal. More options — Results from source: From this drop-down, you can choose the same filtering options that appear at the top of the Social Mention search results page. You can choose several options, such as Blogs, Microblogs (such as Facebook and Twitter), Bookmarks (such as Reddit), Video (such as YouTube), and Images (such as PhotoBucket or Flickr). More options — Results from location: In this field, you can type in a specific source. For example, if you’re interested in only Facebook posts, you can type facebook.com in this field to show only Facebook posts containing your search word or phrase. More options — Results from <timeframe>: This drop-down is pretty self-explanatory. You can choose how far back you want to go in your search, from the last hour to the last month. The default is anytime. More options — Results per page: From this drop-down, you can choose how many results display on a results page, from 10 to 100. More options — Language: From this drop-down, you can choose the language of the returned results. So, if you want only English results, choose that and you won’t get any results in other languages. More options — Sort results by: From this drop-down, you can choose to sort by date or source. Date gives you the most recent results first; source displays your results alphabetically by the source Web site, such as facebook.com or twitter.com. More options — Don’t show results from these users: Say there’s a certain Twitter or Facebook user that you want to exclude from your search results — perhaps an Internet troll whose posts offer no value. Just type in that user’s name and his or her posts will be eliminated from the search results. If you want to exclude multiple users, you must separate them with a comma in the text field. You can set preferences for the results per page and language options to always be the same so that you don’t have to change them every time you search. Just click the Preferences link below the Advanced Search link next to the Search box to set those preferences. 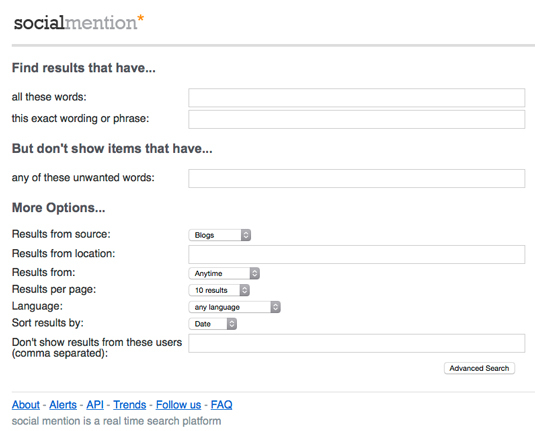 Figure 1: Social Mention advanced search.